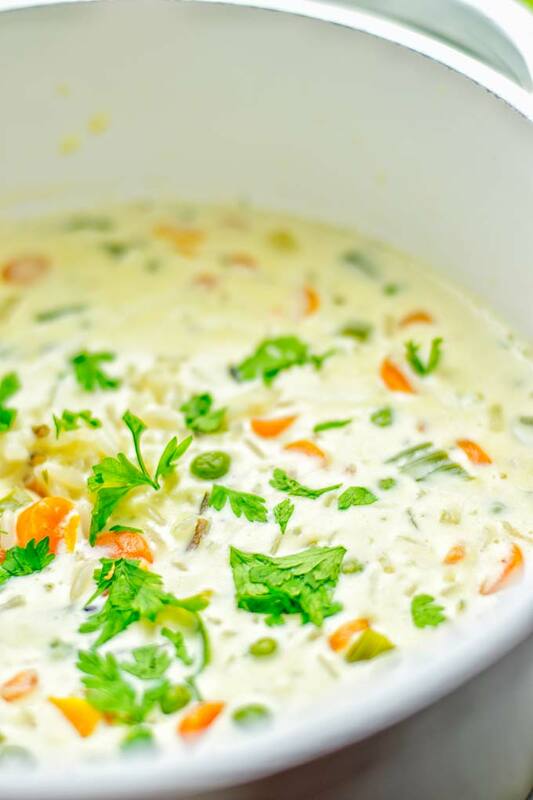 This creamy and indulgent Cream of Wild Rice Soup is the ultimate comfort food. It’s entirely vegan, gluten free, and super easy to make in one pot. 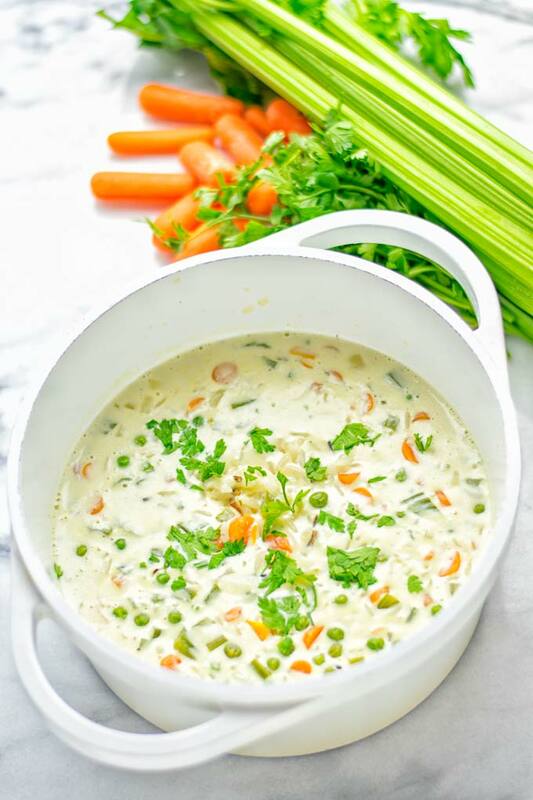 Who does not adore creamy and amazingly tasty soups? See we all do. What’s not to love? I’m all-out for one pot meals like this Cashew Curry Broccoli Stir Fry or my Lentil Chickpea Yellow Curry. If you’re looking for more delicious and super easy to make one pot meals, look no further. Use the search bar and go for a tour. 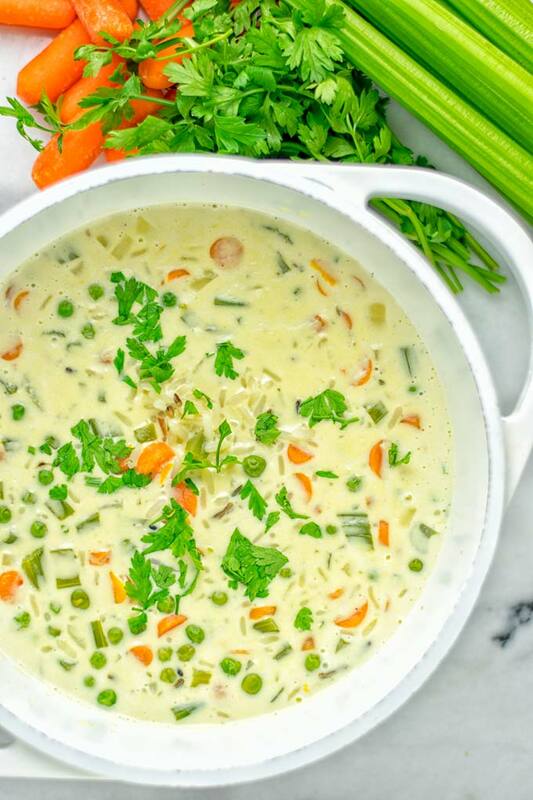 This Cream of Wild Rice Soup is no exception. It’s creamy, one pot made, hearty, warming, rich, packed with amazing flavors in and out. Delicious from the first to the last bite, texture perfect and a must make for everyone having a big soft spot for delicious and easy food. We use a wild rice blend. That means it cooks fast and is done in 20 minutes. You don’t even have to make the rice separately. We prepare everything in one pot. If you prefer a plain wild rice, it will take quite a bit longer than with the wild rice blend. You can calculate a total time of 50 minutes, so you will need the double time. For me I like both a wild rice blend and regular wild rice, but I have to admit I prefer the blend, because it’s simply done in half the time. 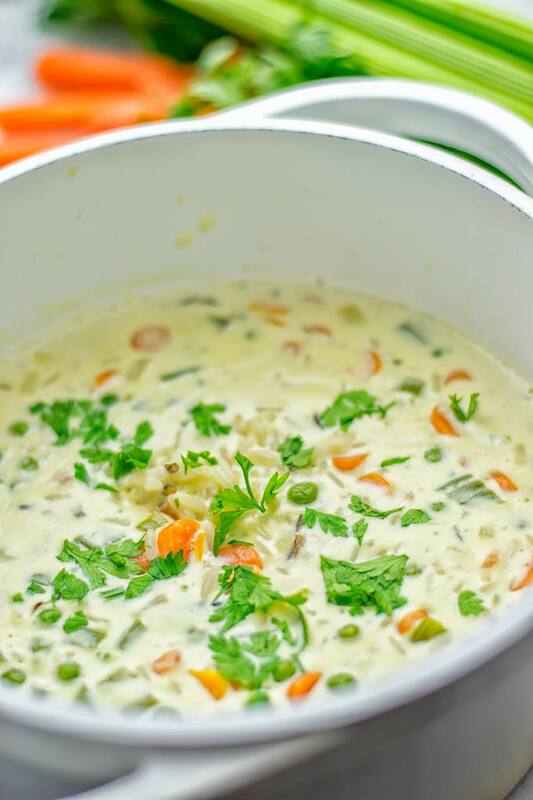 Traditional wild rice soup is often made with chicken, butter, and cream. Obviously not plant based. like peas, carrots and so on which adds a lot of texture. For sure one can use cashew or other nuts for creaminess. Blended with water or vegetable broth, you get the dairy free cream you want and like. 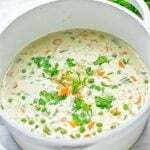 For this Cream of Wild Rice Soup I keep it really simple. You don’t even need a food processor or blender. It’s all made in one pot, that’s everything you need, no other equipment or gadgets are required. So I’m pretty sure you absolutely admire the easy and straightforward beauty of this vegetable soup. For the creaminess I used vegan cream cheese and optional coconut milk, which takes it to another level. I find the combination of both amazing. If you are really into a rich and creamy flavor, that’s surely the way to go. First, heat a pot with a bit oil or vegetable broth if you avoid oil. Add garlic, carrots, optional onions, celery, and fry for around 5 minutes. Next add wild rice blend and cream cheese. Cook everything for about 15 minutes. 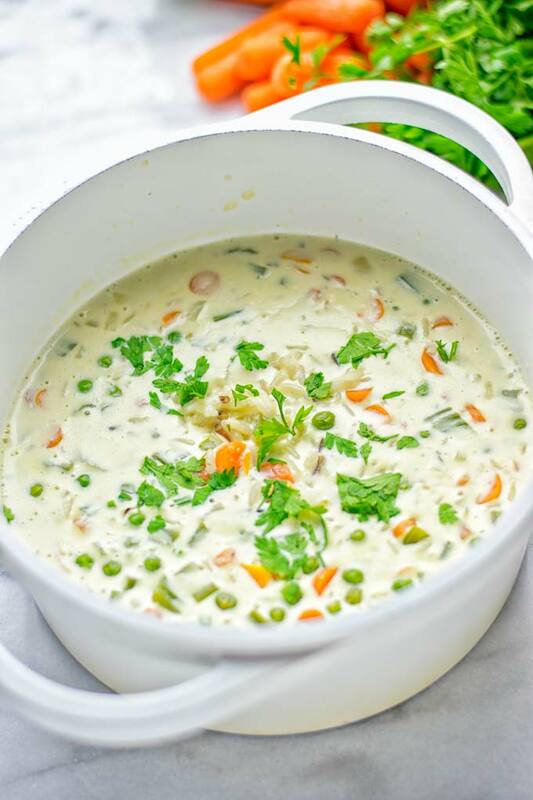 After that add peas plus optionals like nutritional yeast, coconut milk, and let simmer for around 7 minutes longer. This makes such an amazing dinner, lunch, meal preparation and is also really delicious for the holidays, upcoming Thanksgiving and Christmas. Also this will truly one all time favorite for date night for real. The flavors, the texture, the taste – everyone will love this plus it’s super easy and straightforward to make in one pot. So there is no need for longer preparation time and complicated steps. This soup makes meal preparation and date night a breeze for everyone. No one will miss the meat, butter or cream. Its so rich with the dairy free cream cheese and optional coconut milk. I made this recently for friends and everyone couldn’t believe it’s vegan and made with such simple ingredients in no time. 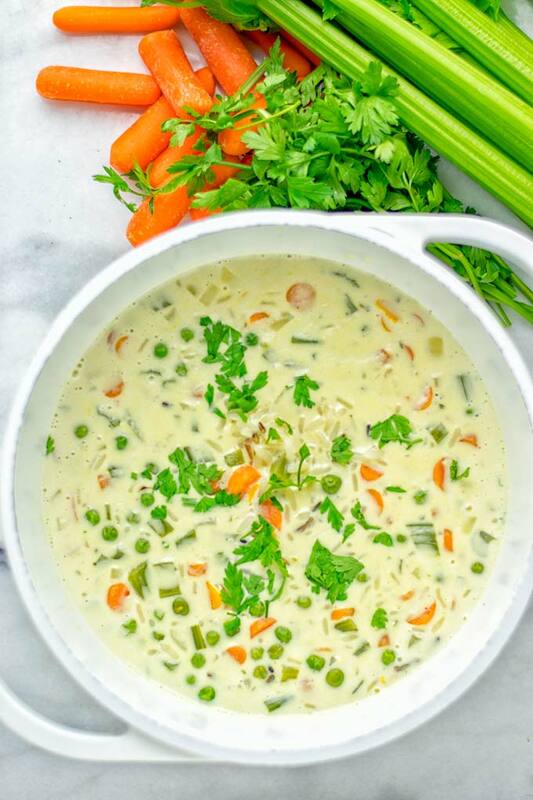 If you try this Cream of Wild Rice Soup, tag me on Instagram or Facebook. Love seeing all your remakes even better with a picture.